Typical solar farm. RMP's newly proposed subscriber farm will be 15 megawatts in capacity. The utility is proposing a Blue Sky subscriber solar program. 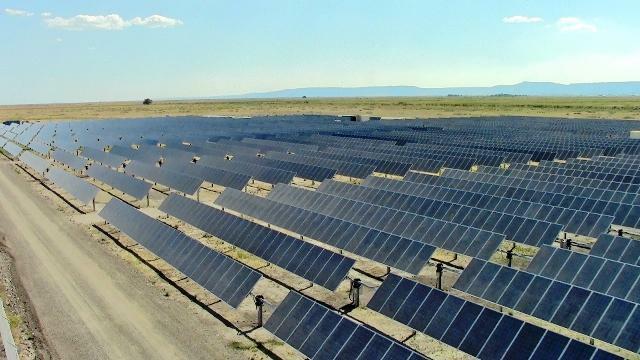 It’s now seeking approval from the Utah Public Service Commission along with a request for proposals to build the 15 megawatt solar project to supply subscribers. Paul Murphy is spokesman for Rocky Mountain Power. He says the 40,000 current subscribers to Blue Sky show that people want more renewable energy choices. “We hope that the program is so successful that we will have to build a lot more than 15 megawatts of solar power,” says Murphy. Matt Pacenza is the executive director of HEAL Utah, a clean energy advocacy group. He says the organization appreciates RMP’s newest offering, but he says it’s not aggressive enough to significantly reduce the amount of fossil fuels being used by the company to generate electricity. Pacenza says customers have a say in what they are offered but they need to organize and let their voices be heard in their demand for more clean power.